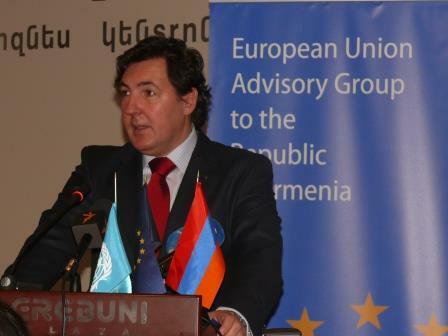 Director of the European Friends of Armenia Eduardo Lorenzo Ochoa has expressed a positive opinion on the cooperation prospects between the European Free Alliance and the Nagorno-Karabakh-based Democratic Party of Artsakh. Speaking to Tert.am, he shared his positive outlook on the future joint efforts between the two parties, highlighting also the importance of the Nevarre parliament’s recent declaration condemning the Armenian Genocide. “The business of the European friends of Armenia is to tighten relations between people interested in this part of the world and the Armenians that are interested in Europe. The cooperation is going rather well, and my expectation is that the cooperation will deepen and increase. As I understand, you have to ask also this question to the decision-makers, to the European Free Alliance and the Democratic Party of Artsakh. But that’s my opinion, that’s my thought on this,” he said. Addressing the declaration, Mr Lorenzo first of all pointed to their organization’s role. “This is the result of the European Friends of Armenia work and the result of different commissions and different parliamentarians. I think this is a very positive outcome, and the declaration, it contains several interesting points. First of all, it reminds the tragic anniversary and there is also the need not to forget this particular unfortunate event. In the declaration the parliamentarians showed their sympathy with the Armenians and the support to the Armenian people’s efforts, so of course this statement, this declaration is very important,” he added.